a Department of Nutrition Iran University of Medical Sciences, Tehran, Iran. b Department of Physiology Iran University of Medical Sciences, Tehran, Iran. c Nano Vichar Pharmaceutical Ltd, Tehran, Iran. d Department of Pharmacology Iran University of Medical Sciences, Tehran, Iran. Crocus sativus, known as saffron, is used in folk medicine for treatment of different types of diseases, and its anti-inflammatory and free radical scavenging activities have been demonstrated. The present study evaluated gentamicin nephrotoxicity in saffron treated rats. Male Wistar rats (200-250g) were treated with saffron (40 or 80 mg/k/d) for 10 days, or saffron (40 or 80 mg/ kg/d) for 10 days and gentamicin 80 mg/kg/d for five days, starting from day 6. At the end of treatment, blood samples were taken for measurement of serum creatinine (SCr) and BUN. The left kidney was prepared for histological evaluation and the right kidney for Malondialdehyde (MDA) measurement. Gentamicin 80 (mg/k/d) increased SCr, BUN and renal tissue levels of MDA and induced severe histological changes. Saffron at 40 mg/k/d significantly reduced gentamicin-induced increases in BUN and histological scores (p<0.05). Gentamicin-induced increases in BUN, SCr and MDA and histological injury were significantly reduced by treatment with saffron 80 mg/k/d (p<0.05, p<0.001, p<0.05, and p<0.001 respectively). In conclusion, our results suggest that saffron treatment reduces gentamicin-induced nephrotoxicity and this effect seems to be dose dependent. Key terms: Saffron, Malondialdehyde (MDA), aminoglycoside, renal failure. Aminoglycosides, such as gentamicin, are a class of clinically important antibiotics used extensively in the treatment of infections, particularly against aerobic gram negative bacteria (Nagai and Takano, 2004). However, nephrotoxicity and ototoxicity there are serious side effects in the use of aminoglycosides. The toxicity of gentamicin, the most widely used drug in this category, is believed to be related to the generation of reactive oxygen species (ROS) in the kidney (Baliga et al., 1999; Martínez-Salgado et al., 2002). ROS induces vasoconstriction and decreases glomerular filtration rate (GFR). ROS also induces cellular injury and necrosis via lipid peroxidation and protein modification (Edson and Terrell, 1999). Most of the intravenously administered dose is excreted in the urine, whereas some of the aminoglycoside injected is selectively accumulated in the renal cortex (Nagai and Takano, 2004; Konopska and Warwas, 2007) leading to renal cell injury. Crocus sativus L. (Iridaceae), commonly known as saffron, is used in folk medicine for various purposes, such as an aphrodisiac, antispasmodic and for expectorant effects (Rios et al., 1996). Modern pharmacological studies have demonstrated that saffron extracts have antinociceptive, anti inflammatory (Hosseinzadeh and Younesi, 2002), antitumour (Escribano et al., 1996; Nair et al., 1991; Salomi et al., 1991), radical scavenger (Abdullaev, 1993), and anticonvulsant effects (Hosseinzadeh and Khosravan, 2002). In addition, it has been shown that saffron improves learning and memory (Abe et al., 1999; Zhang et al., 1994). Chemical studies of C. sativus have shown the constituents to include crocin, crocetin, safranal and picrocrocin (Tarantilis et al., 1995; Escribano et al., 1996; Lozano et al., 2000). Among these constituents, crocetin is mainly responsible for pharmacological activities (Abe et al., 1999). A recent study demonstrated protective effects for aqueous saffron extract (Crocus sativus L.) and its active constituent, crocin, against renal ischemia reperfusion induced oxidative injury in rats (Hosseinzadeh et al., 2005). We then attempted to develop new strategies for preventing the nephrotoxicity of aminoglycosides. The aim of the present study was to assess the protective effects of aqueous saffron extract on gentamicin induced nephrotoxicity in rats. The experimental protocol was approved by the Ethics Review Committee for Animal Experimentation of Iran University of Medical Sciences. Adult male wistar rats weighing 200-250 g were used. All of them were kept in the same room under a constant temperature (22 ±2 oC) and illuminated 7: 00 a.m. to 7: 00 p.m., with food pellets and water available ad libitum. Animals were divided randomly into six groups, each with 8 rats. Group 1 was the control group in which animals were only treated with normal saline for five days, Group 2 was given gentamicin (Alborz-Darou Pharmaceutical Co.) 80mg/kg/d (IP) for five days, Group 3 was given aqueous saffron extract(40 mg/kg/d) orally for 10 days, Group 4 was given aqueous saffron extract (80 mg/kg/d) orally for 10 days, Group 5 was given aqueous saffron extract (40 mg/kg/d) orally for 10 days and was given 80 mg/kg/d gentamicin (IP) for five days starting from day 6, Group 6 was given aqueous saffron extract (80 mg/kg/d) orally for 10 days and was given gentamicin 80 mg/kg/d (IP) for five days starting from day 6. After 5 days of treatment with gentamicin (80 mg/kg/d), control and experimental animals were anaesthetized with Xylazine (10 mg/kg/d) and Ketamine HCl (50 mg/kg/d); Xylazine was purchased from Chanelle Pharmaceutical Co., Galway, Ireland and Ketamine HCl from Parke-Davis Pharmaceutical Co., Cambridge, UK. Then anaesthetized rats were sacrificed in a rapid and painless method and blood was collected and serum samples were separated by centrifugation and used for measurement of serum creatinine (SCr) and BUN using a commercial kit (PA, Tehran, Iran) and Hitachi multianalyser (Hitachinaka, Japan). The abdomen was opened and kidneys were dissected out and the left kidneys were processed for light microscopic (Olympus-BH-2) observation, according to standard procedures. The kidneys were fixed in phosphate-buffered 10% formalin and then embedded in paraffin wax, sectioned (4-5μm) and stained with Hematoxylin and Eosin (H&E). The right kidneys were removed and maintained at -80 °C (Fernandez et al., 1997). On the day of analysis, the kidney tissues were homogenized in cold KCl solution (1.5%) to give a 10% homogenate suspension and used for biochemical assays. Malondialdehyde (MDA) levels, as an index of lipid peroxidation, were measured in renal tissue. MDA, as a thiobarbituric acid reactive substance (TBARS), reacts with thiobarbituric acid (TBA) to produce a red colored complex that has peak absorbance at 532 nm (Fernandez et al., 1997). Absorbance was measured in the visible range using an ELISA plate reader (Helsinki, Finland). Phosphoric acid (3 ml; 1%) and TBA (1 ml; 0.6%) were added to 0.5 ml of homogenate in a centrifuge tube and the mixture was heated for 45 min in a boiling water bath. After cooling, 4 ml of n-butanol was added to the mixture and vortex-mixed for 1 min followed by centrifugation at 20000 rpm for 20 min. The organic layer was transferred to a fresh tube and its absorbance was measured at 532 nm. The standard curve of MDA was constructed over the concentration range of 0-40 μM (Uchiama and Miahara, 1978). 0; no sign of necrosis (no damage), 1+; necrosis of individual cells, 2+; necrosis of all cells in adjacent proximal convoluted tubules, with survival of surrounding tubules, 3+; necrosis confined to the distal third of the proximal convoluted tubule with a band of necrosis extending across the inner cortex. 4+; necrosis affecting all the three segments of the proximal convoluted tubule. Serum Cr and BUN and tissue MDA levels are presented as Means ± S.E.M. Means of groups were compared by one-way analysis of variance (ANOVA) then Post-Hoc analysis (Tukey test) was performed for assessing specific group comparisons. Mann-Whitney U test was used for comparison of histological data. The level of statistical significance was accepted as p <0.05. Calculations were performed using the SPSS statistical package (version 14). Serum creatinine (SCr) and BUN were normal in control group (0.55 ± 0.03 and 17.7 ± 2.07, n = 8). Treatment with gentamicin for five days induced renal functional deficiency as demonstrated by significant increase in SCr and BUN levels (1.05 ± 0.07 and 49.67 ± 3.97, p<0.001, Figure 1 and 2). Saffron at doses of 40 mg/ k/d or 80 mg/k/d did not significantly change serum creatinine (0.54 ± 0.02 or 0.63 ± 0.03, Figure 1) and BUN (17.33 ± 1.706 or 18.83 ± 1.95, Figure 2). 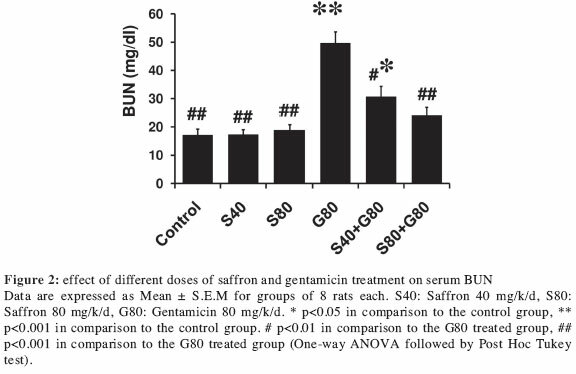 Treatment with saffron 40 mg/k/d for five days before gentamicin treatment and five days co-treatment reduced functional defects revealed by significant decreases in serum BUN levels (30.67 ± 3.67 p<0.05, Figure 2), whereas the effects on SCr were not statistically significant (0.91 ± 0.02, Figure 1). Moreover, SCr and BUN in the S40+G80 treated group showed a significant difference when compared to the control group (p<0.01 and p<0.05, respectively, Figure 1 and 2). Gentamicin-induced nephrotoxicity was reduced significantly by the saffron 80 mg/ k/d treatment as shown by decreased levels of SCr and BUN (0.79 ± 0.04, p<0.05 and 24 ± 2.91, p<0.001 respectively, Figure 1 and 2). In addition, SCr in this group was significantly higher than in the control group (p<0.05, Figure 1). Tissue MDA levels increased from 40.7 ± 3.2 in control group to 83.46 ± 8.11 in gentamicin 80 mg/k/d treated rats (p<0.001, Figure 3). Saffron at 40 mg/k/d and 80 mg/ k/d did not change tissue MDA levels (46.3 ± 3.46 and 41.25 ± 4.01, respectively). 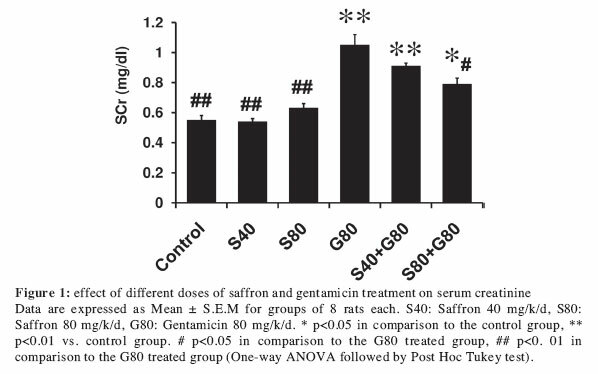 Increased tissue levels of MDA in gentamicin (80 mg/k/d) treated rats were reduced by pre and co-treatment with saffron 80 mg/k/d (55.9 ± 6.5, p<0.05, Figure 3). In the case of 40 mg/k/d saffron, this was not significant (77.51 ± 6.76). In the control group, saline treatment failed to produce histological lesions in the left kidneys. Treatment with gentamicin 80 mg/ k/d for five days induced moderate to severe histological damage (p<0.001, Table 1) with dominant tubular necrosis extended to distal parts of proximal tubules and epithelial cells dissociation with cast formation, lose of brush border in large parts of proximal tubules and tubular obstruction. In groups of saffron 40 and 80 mg/k/d treated rats there was no sign of histological changes or cellular necrosis, whereas both saffron 40 and 80 mg/k/d reduced gentamicin induced tissue injury (p<0.05 and p<0.01 respectively, Table 1). In the S40+G80 treated group necrosis and epithelial cell damage were restricted to groups of tubular cells in proximal parts of convoluted tubules (p<0.01 vs. control group) and in S80+G80 treated rats, damage was seen only in individual cells in proximal tubules with preservation of epithelial cells brush borders (p<0.05 vs. control group). In our study, administration of gentamicin 80 mg/k/d for five days induced acute renal failure shown by functional and histological evidence. Moreover, gentamicin increased the level of renal tissue MDA production, which suggested involvement of free radicals in gentamicin-induced nephrotoxicity. 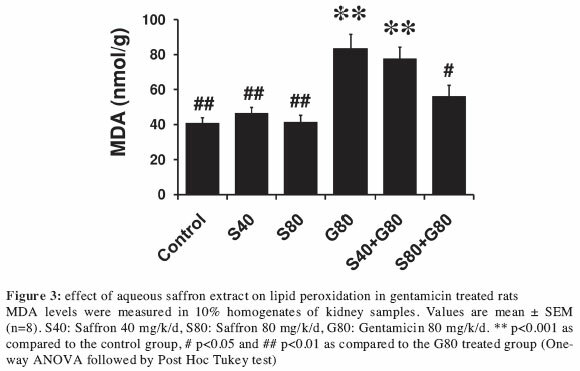 Our study showed for the first time that saffron extract can reduce gentamicin-induced nephrotoxicity and preserve renal function and histology, and this effect was dose-dependent and associated with inhibition of gentamicin increased tissue MDA levels. Drug-induced nephrotoxicity is an important cause of renal failure (Perazella, 2003). Aminoglycosides throughout the endocytic pathway are taken up into the epithelial cells of the renal proximal tubules and stay there for a long time, which leads to nephrotoxicity. Acidic phospholipids, broadly distributed in the plasma membranes in various tissues, were considered to be the binding site of aminoglycosides in brush-border membrane of proximal tubular cells (Nagai and Takano, 2004; Nagai, 2006). In accordance, the present study showed a moderate to severe histological profile in gentamicin treated group with lost brush borders in apical parts of tubular epithelial cells that was dominant in large part of proximal tubules (Table 1). It had been shown that gentamicin treatment causes enhanced generation of superoxide anion and hydrogen peroxide (Baliga et al., 1999; Walker et al., 1999) and accelerates lipid peroxidation in the renal cortex as reflected by increased MDA, an end product of lipid peroxidation, and by depression of poly unsaturated fatty acid (PUFA), which serve as substrates for free radical attack (Holub, 1987; Chance et al., 1979). Gentamicin has been shown to lead to release of iron from renal cortical mitochondria and to enhance generation of hydroxyl radical. These in vitro observations have been supported by in vivo studies in which scavengers of reactive oxygen metabolites and iron chelators have shown to be protective in gentamicin induced acute renal failure (Martínez-Salgado et al., 2002). In the present work, along with gentamicin induced renal functional and histological impairments, there was a concomitant increase in tissue MDA levels that was in agreement with other studies (Holub, 1987; Chance et al.,1979). This confirms the role of ROS and lipid peroxidation in gentamicin induced nephrotoxicity. In a study designed to approximate a structure-activity relationship, two bioactive constituents of saffron extract were tested, namely crocin and safranal. Crocin showed high free radical scavenging activity, followed by safranal. This free radical scavenging activity may derive from the ability to donate a hydrogen atom to free radicals (Assimopoulou et al., 2005). Purified crocin with purity of >99.6% has an antioxidative activity at concentrations up to 40 ppm. At 20 ppm the antioxidative activity of crocin is comparable to that of butylated hydroxyanisole (BHA; an antioxidant is used in cosmetics, drugs and foods that have unsaturated fatty acids in their structures) (Pham et al., 2000). In laying hens following 6 weeks of feeding with saffron, the rate of lipid oxidation was determined in refrigerated stored shell eggs and revealed that MDA levels in saffron diet groups was less than control group (Botsoglou et al., 2005). In our study pretreatment with saffron 80 mg/k/d for five days followed by co-treatment with gentamicin 80 mg/k/d, reduced gentamicin induced high tissue MDA levels (Figure 3). Related to saffron antioxidant properties in different experimental evaluations, it has been shown that pretreatment with crocin markedly inhibits oxidizing reactions after global cerebral ischemia (Zheng et al., 2007) and in hippocampal tissue after ischemia (Hosseinzadeh and Sadeghnia, 2005). In addition, pretreatment with crocus sativus (100 mg/k/d) 7 days before the induction of cerebral ischemia increased the contents of glutathione (GSH) and its dependent enzymes, while preventing elevation of MDA, glutamate and aspartate contents. All this correlates well with histopathology by decreasing neuronal cell death (Saleem et al., 2006). Crocin pretreatment also reduces lipid peroxidation products, including MDA, and increases antioxidant capacity in renal ischemia-reperfusion (Hosseinzadeh et al., 2005).The results obtained in the present investigation suggest that saffron extract has an overall protective effect against gentamicin induced nephrotoxicity. The observed protective effects might be attributed to the decreased levels of MDA that correlated with histological and functional data. Botsoglou et al., 2005), where it has been demonstrated that the inhibitory effects of saffron against different malignant cells also was dose dependent (Abdullaev Jafarova et al., 2002). Saffron pretreatment for five consecutive days prior to the administration of anti-tumor drugs, including cisplatin, significantly inhibited anti-tumor drug induced cellular DNA damage (Premkumar et al., 2006). These findings, together with other previous results, suggest a potential role for saffron as an anti-genotoxic, anti-oxidant (Abdullaev Jafarova et al., 2002) and chemopreventive agent (Premkumar et al., 2006). A common feature of cytotoxicity induced by cisplatin and gentamicin is induction of ROS and lipid peroxidation (Ramsammy et al., 1985; Vermeulen and Baldew, 1992; Wachowicz and Kustro-, 1992; Fauconneau et al., 1995). In the present study saffron extract inhibited lipid peroxidation and MDA production which was in agreement with findings on cisplatin (Premkumar et al., 2001; Premkumar et al., 2006). In conclusion, the present study demonstrated a potent reno-protective effect for saffron extract against gentamicin-induced lipid peroxidation and nephrotoxicity. Saffron-gentamicin co-treatment in our study suggests a new therapeutic strategy, but the precise mechanisms involved in saffron-induced renal protection requires further studies. Received: 16-05-2009. In revised form: 18-07-2009. Accepted: 06-08-2009.